Part Number 3051162 replaces: 08067766, 3012698, 3051162, 3051361, 3131687, 548, 8067766, AP2121517. The front drawer glide is designed to help the bottom drawer on your range slide in and out smoothly. If the drawer is not operating as intended, or the drawer will not close all the way, the front drawer glide may require changing. Luckily this is a very easy repair, all you need is a flat head screwdriver. Simply snap the old drawer glide out, and snap the new one in. Use the flat head screwdriver to pop out a stubborn old drawer glide. The front door glide differs in shape from the rear drawer glide, so ensure you have the correct part prior to installation. This product is sold individually. Do I need to change all of my drawer glides at once, if so how many do I need and are there different ones for the left and right? Hi Olivia, we recommend changing all 4 of your drawer glides at the same time for an even wear. 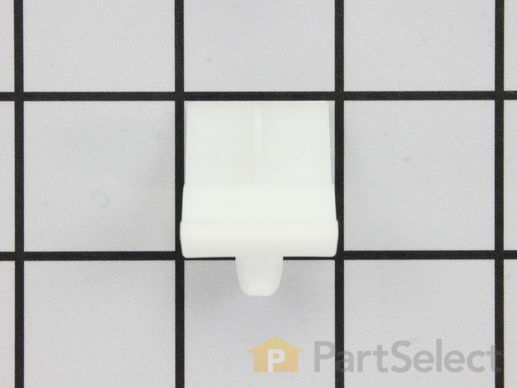 With that said, you will need 2 front drawer glides 3051162, and 2 rear drawer glides 3051163. Best of luck with this repair! Opening the stove drawer is a task every time, what is my most likely issue and can I fix it myself. Hello Lenard, if you are experiencing difficulties opening the stove drawer the most common solution would be replacing the rear/front drawer glides. We recommend using a flat blade screwdriver to pop them off before installing your new ones. Part number 3051162 is for your front, and part number 3051163 is for your rear, and do not worry, this should be a very easy repair. I hope this helps! My drawer glides seem to be fine. I am having a hard time finding the piece that the drawer glides slide on, that are on the inside wall of the stove. They are located at the front of the appliance on the sides (one on each side) where the drawer goes. Hi Sally, Thank you for the question. The lip of the drawer slides on these glides. 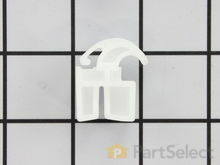 The Front glide is PartSelect Number: PS434226 and the rear glide is PartSelect Number: PS434227. The glides are attaches to the inside wall where the drawer is installed onto. Hope this helps! I've got something stuck behind drawer. Can I get drawer out without breaking glides? Hi Sharon, Thank you for your question. You should be able to pull the drawer open all the way then lift up a bit on the back to pick then up over the glides and the drawer should come out. Hope this helps! Hi Ryan, Thank you for the question. There is a total of 4 glides on the appliance. Two in the front (PS434226) and two in the rear (PS434227). Hope this helps! Hi Scarlett, you will find the front drawer glides on the left and right of the inner side of the door. There should be an opening on the frame where the glides should easily hook in and out of place. To take them out you should use a flat blade screwdriver to snap them off. Please let us know if you have any further questions. Part arrived quickly. You Tube video was unexpected bonus!! Thank you. OEM part - so easy to install. Thank you for the step by step video. Needed to repair oven drawer. I looked up videos on how and what to repair it with and came across the partselect YouTube channel which led me to the website. One of the easiest shopping experiences I've had online. Would highly recommend. The parts worked perfectly and my oven drawer slides in easily. Front drawer glide part-received the next day. The part was easy to install. The drawer is back working. Easy to install. Snap in fit. good part, good fix, good price. easy peasy! It arrived quickly, was a snap to install, and my appliance is back in working order.